In this podcast we discuss cutting edge strategies with security: sandboxing, block until verdict, remediation and roll back. What does a product manager do at a high-profile security company like SonicWall? 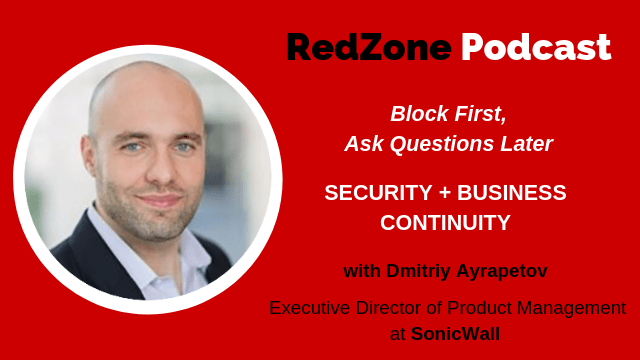 Evolution of Security – Block first, then ask questions later. Staying current with security is imperative with a current approach centered on business continuation. New ways of thinking – Prevention vs. Continuity, continuous operations like auto-rollback functions. Supply Chain Attacks – Next Gen behavior analytics which led us into an industry education on old fashioned heuristics vs. machine learning and AI. Dmitriy Ayrapetov has been with SonicWall for over 13 years. He is currently the Executive Director of Product Management at SonicWall, in charge of product security. Prior to this position, Dmitriy held product management and engineering roles at SonicWall and at enKoo Inc., an SSL VPN startup acquired by SonicWall in 2005. As a cybersecurity expert, he speaks at industry conferences including, RSA, Gartner Security Summit, Dell World and is a regular presence at SonicWall’s annual partner conference Peak Performance. Dmitriy holds an MBA from the Haas School of Business at U.C. Berkeley and a BA in Cognitive Science at UC Berkeley. You can see all the SonicWall products Dmitriy has had his hand on since the beginning. Learn How to Detect and Prevent Malicious Files with SonicWall Capture ATP: https://www.youtube.com/watch?v=55tw20crqhk, pub. Sept 1, 2017. There are two people that Dmitriy mentioned as thought leaders in the field: one of them is well known, Bruce Schneier, an internationally renowned security technologist; while the other is less known, Dan Geer, CISO at In-Q-Tel. Bruce provides a lot of industry as well as practical advice on his website: https://www.schneier.com/. Dan’s keynote at Black Hat 2014 was, in my opinion, direction setting. It was one of the highest signal to noise ratio keynotes that I’ve ever heard and I still come back to it from time to time. It’s very dense, and is based on an essay that he authored. The book that Dmitriy mentioned early in the podcast is Hacking Exposed –they’re on the 7th edition now. I’m not “recommending” the book, I just referenced it as something that piqued my curiosity in security early on. Can You Accelerate Security to Move At The Speed Of Your Business?